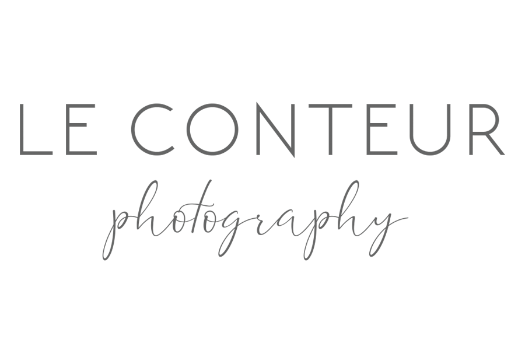 At Le Conteur, we believe having an engagement photo session is important for several reasons. First, this time allows you, as a couple, to get comfortable in front of the camera with us, and figure out how we work best together before the main event. Next, you can showcase your personalities in a more casual setting, while creating some fun, memorable images for wall portraits, your wedding sign-in book, guest signature board and Thank You cards (shot early enough, we can also provide the images for your Save the Date cards and invitations). Best of all, you can remember this special time forever with personal memories of just the two of you. We strive to accommodate your schedule in any way we can, but please allow 2 months in advance of your wedding for the optimal use and enjoyment of and from your images. If you have enough time before your wedding you may have the option to pick the Season of your Engagement Session. If that is the case either select your favorite Season, fall leaves, crisp cool days anyone? Or go with the same Season as your wedding to showcase the beautiful photos from your Engagement Session at your wedding. The setting for your Engagement Session can be as unique as the two of you. Urban, Natural, City, Park, Lake, if you can think of it - we can do it. The most important thing to consider is how the two of you will feel in the environment. After all your connection is the most important part of the session. If you love the city skyline, let's do that. If you love a more intimate setting in a park at sunset, we are there. Look good - feel good! 1) Don't get crazy worked up about this, it is clothing after all and you literally wear clothes every day. 2) Wear clothing that makes you feel AWESOME! If for you that is a new outfit - get it - rent it, buy it, borrow it. 3) Fit is so important, it should not be too tight, too loose it should literally be just right. 4) Diet - avoid salty foods at least 3 days before your session to eliminate bloat. 5) Style, it is as simple as this, match your style not your exact outfits. If you are casual, both be casual, if you are dressy, both be dressy. Pinterest is actually great for this and mixing colors - take a moment to view pins selected specifically for Engagements by clicking on this link. How do we be ourselves? We are going to work through your Engagement Session together, walking, talking. laughing - in general have a less awkward First Date! Oh yeah, I went there. We will get to know about it each other, we will do some silly things to create a sense of ease. I will be holding a camera, I will ask things of you, to breathe, to enjoy each other, to be affectionate, to tell each other jokes, to jump around if needed, to sit and take it all in too. We will also work together to smile and look at the camera too. I know, I know... do we have to? The answer is yes and it's going to be alright, I promise. Bring your enthusiasm, your love for each other, some patience, a sense of humor and a smile! We are going to have a good amount of fun while taking photos! Also if you need actual items to bring the following are helpful but keep it light as we will be walking and not in one set location for long. 1) Hydrate - bring some water in a small bag. 2) Snacks or gum or both - think non-messy.